If you missed our Introduction to the 10 Most Underrated Rhythm Guitarists, don’t fret, you can check it out here. 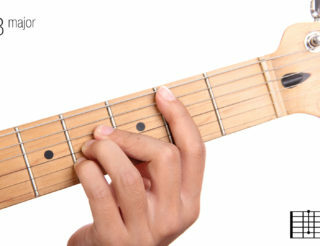 Here at Uberchord, we feel that rhythm guitarists deserve way more credit than they get. That’s why we’re happy to be rolling out a brand new series, beginning with Malcolm Young. Before we start, let’s take a quick scythe at Malcolm Young’s tone. The real meat of the band’s sound came from the interplay between the two Young brothers. For Angus, whose frenetic bursts of lead guitar required a richer sound, there was more saturation. Malcolm Young balanced this out with a much clearer, ‘crunch’ tone. Using extremely heavy strings (0.12) with a wound-G string, this created a protrusive and powerful guitar sound. Using little distortion also meant all component strings of the chord would cut through the clamour of the band. When these two walls of sound met in the middle, the result was a seismic collision of tone; packing the punch of a freight train yet with every note clearly definable. This can only translate so far to audio recording, especially in regard to their older work. It’s live, with columns of Marshall stacks displacing real air that AC/DC’s monster sound can be beheld in its ultimate form. The band has always been pretty unbothered about the fact that most of their songs re-use the same handful of chords. They’ve been pulling it off since the 70’s. That’s not because they’ve yet to exhaust all mathematically possible configurations, but rather that they how to make a few chords go a long way. 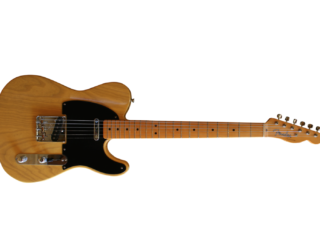 Want to learn the secret to playing like Malcolm Young? We’ve created two exercises to show you how. The keyword here is ‘dynamism’, of which Malcolm Young was a veritable master. Playing at full-intensity all the time would quickly become tedious. 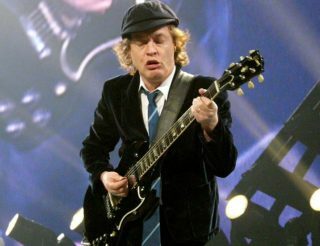 Instead, AC/DC knew how to bide their dynamics for grooving, punchy verses and when to let rip for soaring choruses. Let’s take ‘Shot down in Flames’ as a perfect early example of Malcolm Young’s dynamic restraint. The verse is made of four chords, which to me at least feel like two pairs of chords. Beginning the progression we have a double A to G (the ‘call’), followed by the same rhythm for D to C (the ‘response’). The higher register you hear on the recording is played by Angus, who uses triads on the A and G to create a broader sound. Keep your chords ‘short’. The aim here isn’t to produce a sweeping open-string sound but to keep the verse subdued, tight and rocking. Note the use of light palm-muting here to dampen the sound, which emphasises the launch into the chorus. The chorus kicks in and the heavens open. The chords don’t change in the slightest, but the increased volume, ringing open chords and the distinctive chime of the high-E string gives the song a massive dynamic lift. Note how Malcolm Young never gets lazy. However tempting it may be to get carried away in the moment, he maintains a solid rhythm throughout. He lets chords hang, thereby providing musical ‘pockets’ for the drums and other instruments to fill in. Another tenet of Malcolm Young’s rhythmwork seen everywhere in AC/DC’s songwriting is the use of space. A lot of younger acts nowadays could well take heed of this. Indeed, as is often the case with the band, the gaps in between are often as poignant as the chords themselves. This leans towards the general philosophy of ‘less is more’. In the context of rhythm this means that the songs are allowed to breathe, and the sparse chords gain considerably more power and gravitas. You Shook Me All Night Long is a stellar example of this. On paper, the verse consists of a banal G-C-D chord progression. Listen to how it would sound if strummed constantly throughout. Unrecognisable and uninspiring. For the actual song however, Malcolm Young plays a mean and abrupt rhythm. Each chord sounds purposeful and defined, like musical pillars. Breaking up the rhythm in this way elevates the song from three primary chords to the iconic rock anthem it is today.